The Journal of the Adelaide Botanic Gardens is one of five plant taxonomic periodicals published by Australian herbaria and botanic gardens. It is published since 1976 in print form. Since 2011 all back issues of the Journal are available online. On 1 May 2013 the Journal started electronic publication of articles. This means that papers are available online in PDF format soon after they are reviewed, edited and type-set. Hardcopy is still produced at the end of a year, collating all articles produced between January and December. 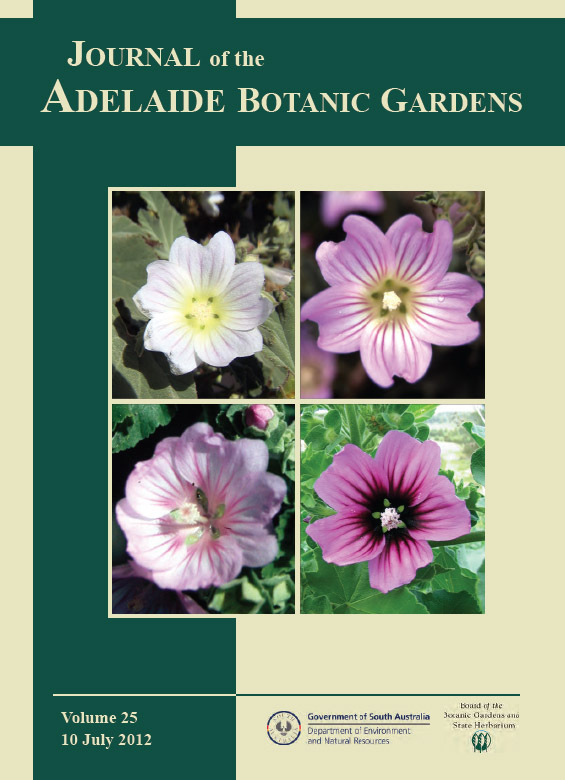 Please visit flora.sa.gov.au/jabg to download the first papers of Vol. 26, 2013. Two articles describing new species of lichen for southern Australia. For authors this will have the advantage of a shorter time between submission of a manuscripts and final publication of the paper. Readers will be able to access papers instantly and free of charge from the Journal’s web-page. Please contact the Editor for more information. This entry was posted in News, Publications on 3 May, 2013 by Jürgen.